I connected with James and his business partner Kris around a year ago, and if you are a regular reader of this blog, you will remember that Kris wrote a guest post last year (click here to read it). 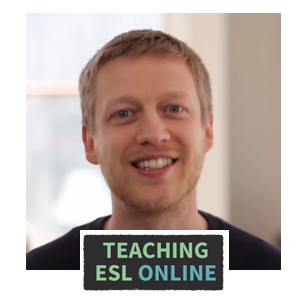 I was excited to get one of the guys back to talk about their new creation for English teachers, and to share their experience of teaching English online to young learners. Kris stepped forward, and in the following interview, he gives some really powerful advice about teaching young learners online, how to find students, and how his new site can make planning for online lessons much easier. James talked about his background, and how he travelled around teaching in different countries before settling in Turkey. He was receiving requests for private learners, and was spending more time teaching these types of lessons and finding them more rewarding. He then decided to move his teaching online. The reasons for doing this included: he saw online learning was growing, he liked the online teaching environment, wanted to save time by not having to commute, and wanted open up his lessons to a broader market. So, this is how his first site (TurksLearnEnglish) was born. The vast majority of his students are young learners from Turkey. James talks about how important it is to have a niche; to specialize in a certain area. We then both discuss the advantages of doing this, including knowing the culture, the language, and other things about our specific learners to ensure that we can offer them the best value. 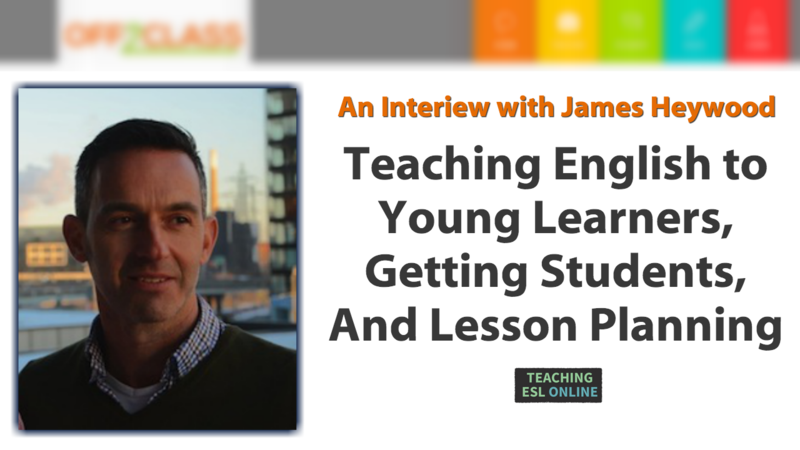 James argues that taking young learners online helps increase motivation, turning technology from a play instrument into a learning instrument. Having the different tools and applications, you can make the learner focus more on the lesson, bringing the child’s attention on to what is happening in the class. James has found this to be really empowering for his young learners. Some tips when teaching young learners: the learner needs to learn in a quiet space, don’t allow interruptions by the parents, don’t allow other devices, communicate with their parents, use their own environment for learning props, and be flexible with the lesson. When starting with a new child, offer a trial lesson with the parent present. James then gave his advice on how to fill up your schedule with online learners. Firstly, he states how important it is to be confident when starting out. He was able to move all but one of his learners to his new online learning environment, and recommends talking with your current learners about making this change. Word of mouth has worked really well for TurksLearnEnglish (something that I and other teachers constantly talk about). To do this, get a landing page up (here are the options available for this); this gives referrals and new learners the ability to know more about you and to be confident that you are a legitimate teacher. James and Kris know their market well and have a very specialized niche. He doesn’t recommend spreading yourself too thin, but instead, be attractive to a segment of the English learning market. Finding the first student is the hardest thing; that it why it’s important to have a strong landing page. We then talk about the important of keeping contacts (something I have written about here). I receive lots of emails about the best resources for online teaching. 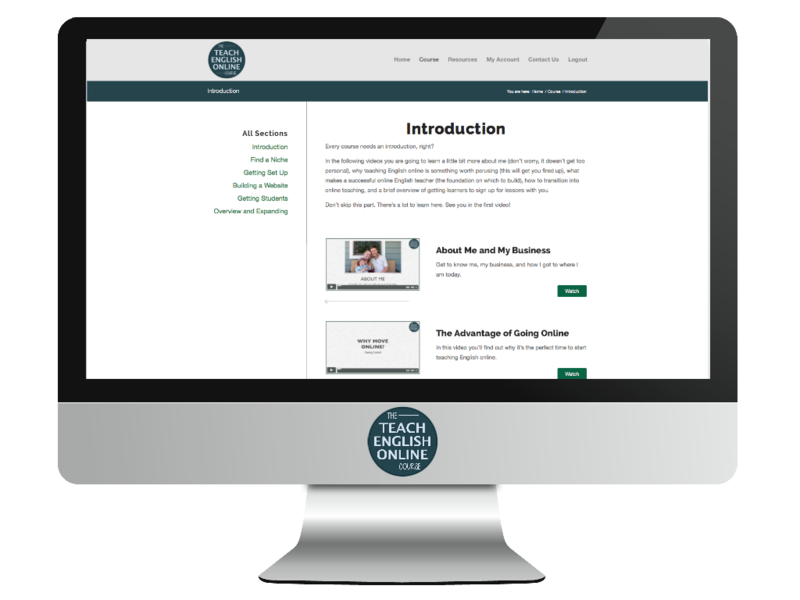 And James and Kris have started something really exciting: a database of lessons plans that you can use online through sharing your screen or through student and teacher logins. You can see the lesson notes on the left hand side and the slides on the right. When a learner is logged in, they don’t see the lesson notes, but as you move through the lesson, their screen will show the slide that you are currently on. As you saw in the interview, there are lots of material involved in each lesson. They are still in BETA, but you can request an account from their homepage. James Heywood has lived and worked in Sydney, Paris, Auckland, Dubai, and has a background in language and linguistics. He is a strong believer in the use of technology in the learning environment. After years of teaching in language institutes and private schools, he made the leap to online in late 2012. He has taught a variety of ESL students online including young learners, adults and adolescents in one-on-one and group settings. Off2Class (lesson plan content for private ESL teachers) was launched to provide lesson content resources targeted to teachers running their own private tutorials. As I mentioned during the interview, I have no experience teaching young learners online, so it was fascinating for me to learn about this. Let us know if you have experience teaching this age group, or whether James has inspired you to do the same. Additionally, I recommend signing up to Off2Class. If you do, please let us know your thoughts. And as always, feel free to leave whatever comments you have about the interview. There was an article popping up in my various social media feeds the other day called, “Why Everyone Should Be On Twitter.” I then realized it was by Mark Barnes, another fellow presenter in the TTO MOOC. I then read some more of his stuff, asked him for an interview, and a couple of days later we met on Google Hangouts. 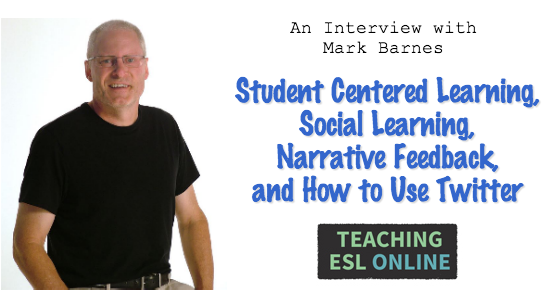 In the interview discussion we talk about student centered learning, narrative feedback, social learning, why teachers should be on Twitter and how best to use this platform. Below the interview I break down what was discussed and relate this to ELT. Mark was a teacher for 20 years, and left the classroom two years ago to focus more on his writing and professional development. Let’s start with..
Mark talks about how he was a “traditional teacher” for the first ten years of his career, but after taking some time to research motivation, he decided to do something different. His biggest focus for this was the final result: learning. To achieve this he created what he calls a chaotic environment, one where kids are working on different things, have long-term projects, and use different technology to head towards a goal and learn whatever the objective is at that time. Mark talks about a system that he pulled from other systems called SE2R (Summarize, Explain, Redirect, and Resubmit). This is using descriptive feedback to eliminate subjectivity and comparisons. It gives the student to go back and revisit prior learning. We then go on to discuss the tools that we can use to achieve this. Mark then goes on to talk about social and mobile learning and how we should find ways to incorporate the devices our students have into their learning. There is then some great advice given in terms of how to do this: watch online videos and actually use the devices and applications that you want to use. And learning how to use these tools will take less time than you think. 1. Free Professional Development: Twitter has an advantage in that it is very professional. Following other educators and following specific chats gives you access to advice and resources in your industry. 2. Kids are moving to Twitter from other platforms. When joining Twitter, it is important to follow these discussions, find “How to Use Twitter Videos,” follow people in your industry (more specifically, find one person who you look up to and follow who they are following), and post with hashtags when first starting. Throughout the interview I related what Mark discussed to ELT. Here are some ideas I talked about and more on reflection. Traditional Marking and feedback: The language schools that I worked in liked exams, and it seemed like half our time was spent on either studying for an exam, taking an exam, or reviewing an exam. I really like the idea of trying to achieve mastery in learning, especially in our industry. Having running feedback, using Google Drive for example, means that we can ensure that our students stop making mistakes that seem to be engrained. 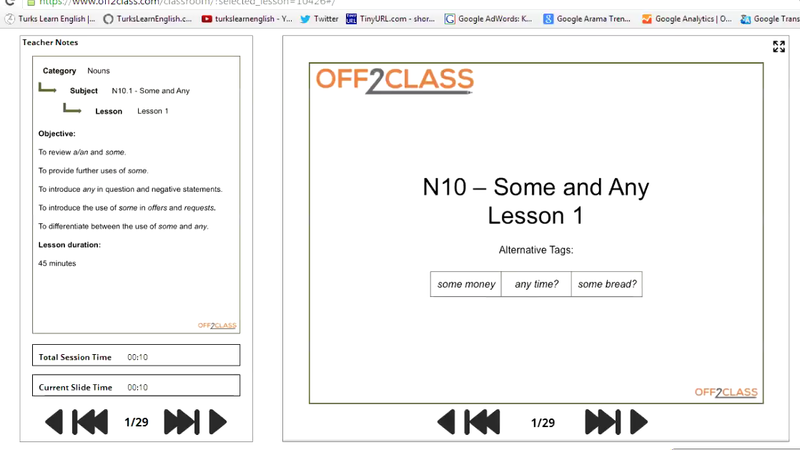 This is something that I have implemented through creating audio resources for my learners. Repetition is such an important part of learning a language. It is our job to make this fun and engaging. Student Centered Learning: Although we didn’t talk about this too much, it is really important that we help our students find their intrinsic motivation. This is what I believe to be at the core of a results based classroom, especially when talking about online ELT. An easy way to do this is to make the lessons centered around the interests of your learners. For example, I have one learner who is an athlete (running, rogaining, skiing, and biking!). The materials we use are centered around these topics. By doing this, we talk about things that she is interested in and she also learns the language that she needs to know. I recently posted a video for my online learners that talks about how to read interesting things and how to subscribe to blogs (click here to watch it). Social and Mobile Learning: As I mentioned in our discussion, I convince my students to change the language of their devices into English, and use these devices to read, listen, and watch things in English. This really helps when it comes to getting the input needed to make progress in English. People are going to use these devices; as educators we need to think about ways to use this to our and our student’s advantage. Twitter: Mark has given me the motivation to follow more discussions on Twitter and to use this platform for professional development. If you follow Marks advice, you will get so much out of this platform. You can follow Mark on Twitter and check out his blog: Brilliant or Insane. And, here is the website Learn it in 5. I also mentioned the Twitter discussion #ELTchat, you can find out more information about this here. Mark talked about Daniel Pink and his book Drive (I’ve just ordered it – I’ve been wanting to get this for a while now), and research from Alfie Kohn. How do you keep a narrative feedback with your learners? How are you incorporating devices into learning? How are you bringing out your learners’ intrinsic motivation? Please leave your comments below; I really appreciate them. Rich Kiker was one of the presenters at the Teachers Teaching Online MOOC hosted over at WizIQ. 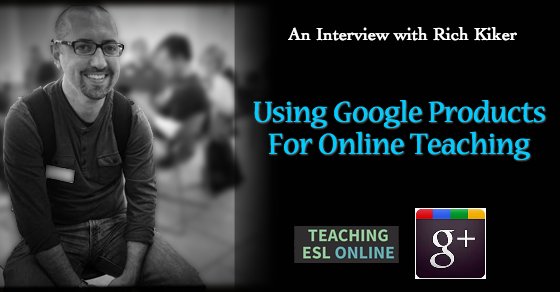 I learned a lot watching his presentation, and as the number one voted Google Apps Trainer in the world, I was eager to interview him so he could share his knowledge and experience with us online English teachers. In the interview I ask Rich about using free Google products and apps as a way to connect and collaborate with our learners. I have used many of these products and know how useful and effective they can be when teaching online. There’s a lot of value in this interview, and below the video I summarize what we talk about, post some resources, and expand on the ideas. We talked about several different Google products and applications during the interview. Let’s start with Hangouts. We started by discussing how to connect with learners online using Hangouts. I was using Google Hangouts on Air (I wrote about this here) for the interview, and Rich talked about the distinction between Hangouts and Hangouts on Air. Hangouts on Air are live events where you want to reach a big audience (or to record the interview like I did), while a private Hangout is what you need to teach your one-to-one or group lessons online. Rich talked about the different features of Hangouts, especially how we can integrate Google Drive. 1. The anytime, anywhere access. The ability to use a cloud based application and work with students no matter where you are or what device you are using. 2. Using Google Drive as a way to collaborate with learners, both live and asynchronously. This is both for written and audio feedback. Here is the application that Rich mentioned so that you can leave audio feedback for your learners, and vice-versa: Kaizena. This is something that I’m going to start using with my students. I then asked Rich about Google Plus and how an online teacher could use this platform to communicate with learners and attract students. He mentioned a guide from Eric Curts as an easy way to get started: click here to access this. You can build your network by adding people to your circles (like following/friending someone on Facebook). You can ask people to share their favourite circles, and start networking within this community. Rich goes onto to say that they are much more powerful than people give them credit for and he actually replaced his thousand dollar computer with a Chromebook.. I found it really interesting when he talked about the difference between local and cloud based applications, and how companies are moving their applications to the web. I feel that getting a Chromebook is a great option for those who want a low cost device as it has everything a teacher needs to teach online. The Chromebook that Rich uses is currently available for under $300. Here is more information about this. Although Rich and I only talked about Google products and apps, I think this interview really highlights the progress in tools available to online teachers and learners in general. Two points really stood out for me: firstly, the fact that applications and work in general is moving from the local space to the cloud, and secondly that collaborating with learners online through the tools mentioned is in many ways more effective than traditional teaching methods. I would love to know your thoughts on these issues and the other things that we discussed. Also, if you have used any of these tools, then please let us know how you are using them and any tricks and tips that you have. For example, how would you use a tool such as Kaizena? You can connect with Rich through Twitter and Google Plus: @rkiker and +richkiker.